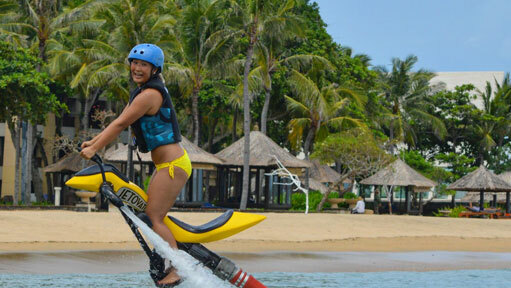 Bali Jetovator or Jet Bike or Jet Bike By Jetovator or Jetovator Bike is One Of the Water Riding a Hose Equipment Originally Build and Manufacture in USA . 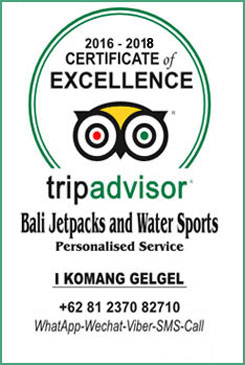 its introduced to Bali a Few Years Back by An Aussie Man as My Good Friend Named Mr.Craig ( Shifty )Jet Bike By Jetovator is a Flying Bike with Three Water Nozzle Which Powered by Seadoo Jet ski at Minimum 155 HP or Yamaha Jet Ski Supercharged 1800 CC.Jetovator is A Level Beginner Type ( Level 1 ) As Easiest Level in its Class Of the Water Hose Riding Equipment . The Person Can Fly easly at 8 Meters Maximum depending the Person weight and Personal Balance. 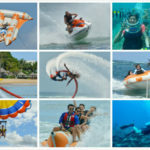 Most Beginner Has Succeed doing this Activities at Firts time and Had an Excellent Experience as soon as it Goes Flying above the Water Surface . At Our Operational The Jetovator Bike Rider will Not Have the Control of How High it Can Goes But The instructor On The Jet Ski will have all Control of How High the Rider Can Fly by Controlling the Jet Ski Accelerator Based on How Well is the Rider can Balancing the Equipment when it Fly Above the Water.